Well, first of all you should decide which type of transport to choose for your trip. We suggest that you would not want to spend your honeymoon traveling by public transport. Taking this into consideration, the most suitable choice for you will be a rental car. Using rental car you can be independent and drive to any place of Milan you want. Plus it’s much more comfortable to travel by car unlike by bus or subway. Don’t know where to get cheap rental car? You can make an advance booking online, select any car you want, and your vehicle will be waiting for you right at Linate Airport. Piazza del Duomo is the major square and the heart of Milan, where you’ll find lots of architectural masterpieces. Located at the center of the city, it has a great importance in art, culture and social life of Milan. Duomo Cathedral is the first and the most important sight of the square you should visit. This magnificent building, designed in the Gothic style, impresses with its size and beauty. You can walk inside the cathedral to enjoy its amazing interior or climb the observation platform to get fantastic aerial views of Milan. 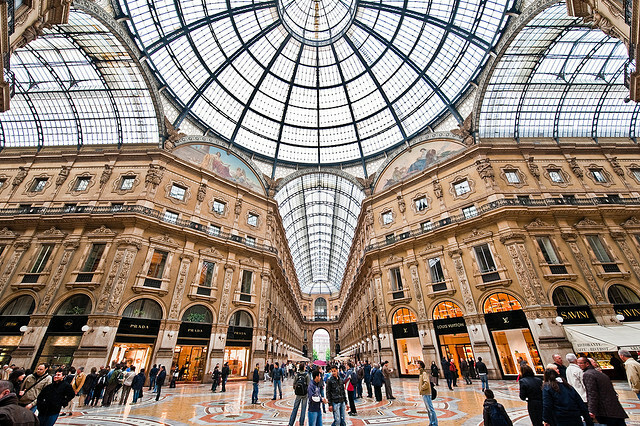 Galleria Vittorio Emanuele II is the next pearl of Piazza del Duomo. It is represented by the majestic triumphal arch that goes deep into the streets covered with glass. Walking down the street filled with numerous shops and restaurants, you can also explore the other unique masterpieces of Milan. And the third famous creation of the square is the Royal Palace (Palazzo Reale di Milano), which was formerly the residence of the city authorities. Nowadays it’s the 2nd cultural center of the city used for art and sculpture exhibitions. Walking through the Piazza del Duomo, it’s impossible not to fall in love with it. Navigli canals is one of the most significant and beautiful sights in the city. It looks like a small Venice in the center of Milan and it’s hard to find a better place for a leisurely stroll with your beloved one. By the way, during the warm months you can also take a boat ride to explore Navigli by water. If necessary, you can find several cozy cafes and restaurants here offering excellent cuisine. The Arch of Piece (Arco della Pace) is the construction dedicated to the end of the dominate of Napoleon Bonaparte. This is a huge 25-meter granite monument consisting of three arcades: one central and two side arcades framed by massive Corinthian columns standing on pedestals. Arco della Pace provides incredible photo-views of the surrounding streets and Sempione Park. In addition, you can walk by the green lawns of the park and reach the famous Sforza Castle located on its territory. The castle consists of magnificent towers and its massive defensive walls symbolize the centuries-old history of the city. Inside the castle there are also several interesting museums dedicated to the city. As you know, Milan is considered the main source of Italian culture and La Scala Opera House is the best confirmation of this. Located not far from the Piazza del Duomo, Theatre La Scala is the most famous theatre in the world and was built according to the request of Maria Theresa of Austria. Its stage remembers performances of the greatest singers and orchestra conductors of all time. Maria Callas, Toscanini and Carla Fracci hit the world for their art within the walls of the La Scala for many years. Nowadays this opera house invites you both to enjoy its performances and for a guided tour. What could be better than a nice evening meal accompanied by melodic jazz music? Well, you can try it in the local restaurant “Blue note”. Their chef offers amazing dishes of Italian cuisine, and atmosphere is just filled with love. We hope you’ll take into consideration the given advice. So, in any case, honeymoon in Milan is an unforgettable event and a nice beginning of the happy family life. Author Bio: Lily Berns is a travel writer who enjoys life travelling and blogging about visiting different countries. Next : FOR A VERY COOL YOU!